PRODUCT: Backer Rod Insertion Tool Set for ROADS & TALL WALLS. 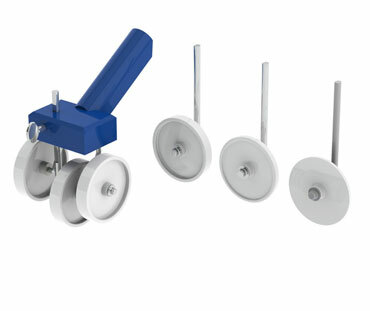 Set includes 4 insertion wheels for 1/8, 1/4, 3/8, 1/2 wide wheels. Reinforced threaded end handle accepts (optional) threaded broom handle for stand-up use. PRICE/SET. Backer rod insertion tool enables quick installation and accurate depth setting of backer rod in roadways and tall walls. Reinforced threaded handle-end accepts standard threaded broom handle extensions for easy stand-up insertion. Interchangeable wheels accommodates common backer rod widths. Depth of setting is adjustable. Not recommended for SOFT backer rod, or larger, rough or irregular joints.